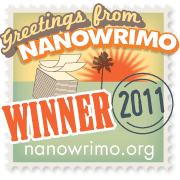 As another fabulous NaNoWriMo comes to a close, I thought I'd look back on a month of hectic wordage. I shall start in somewhat smug fashion and declare myself a winner! It's been a fun November, helped by the fact that I really enjoyed the story I was writing - a lighthearted fantasy novel called Heroes Wanted that should, hopefully, be ready for publication in spring of next year. I did fall quite a long way back for awhile. This was entirely my friend Karen's fault - she came to visit for a weekend. There was boozing, there was gaming, there were excellent fish and chips in Lytham, Lancashire. What there wasn't, was writing. Luckily, I had booked the last full week of November off from work, to dedicate myself to catching up. I eventually finished on the last day of my holiday, Sunday the 27th. It wasn't all writing: I played some Skyrim (awesome) and the Star Wars: The Old Republic beta (less awesome - more on that in another post). But that week was, for the most part, a whirlwind of words. Felt good, felt damned good! So I treated myself to a Sonos Zoneplayer from Amazon - I love this thing! Beautifully simple to set up and use, amazing sound. Anyway, the first draft of the novel is pretty much done. It needs much work, some fleshing out in places, scenes need tweaking and the dialogue needs a going over but, overall, I'm quite pleased with it. So pleased in fact, that I've decided to give you, yes YOU!, a free eBook! A copy of my debut novel, Crystal Eyes, no less! Take yourself over to http://www.smashwords.com/books/view/99280, stick it in your basket and, when you reach the checkout, enter the code CM23Y to get it for nowt! That's free, gratis and for nothing! Once bought, it can be downloaded in formats suitable for any eReader - Kindle, iPad, Nook and so on. NOTE: The voucher code will expire on Saturday the 3rd of December. After that, you gots to pay!